I love the leaves of this little native orchid. Look at that symphony of color and design! 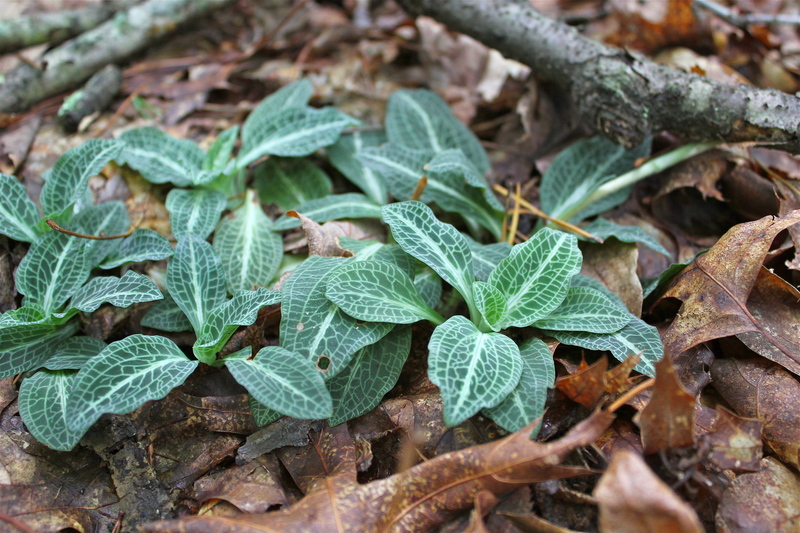 The silver markings on the dark blue-green leaves, along with the bold stripe in the center of the leaf make it easy to identify as rattlesnake plantain. The “plantain” part of this plant’s name comes from the similarity of the shape of the leaf to the common plantain found in waste areas. But don’t be fooled–rattlesnake plantain is really an orchid! I took a couple of these photos back in early spring, when there was little else visible on the forest floor. Ever since, I’ve been waiting for the plant to come into flower. It turns out that bloomtime is late–the flower stalks emerge very slowly in June, and then the flower buds finally begin to open in July and August. The flower stalk can rise 6 to 18 inches above the low-growing basal rosette of evergreen leaves. The stalk is somewhat hairy, or “downy”. The spike of flowers at the top of the stalk is densely packed with buds, as you can see in the gallery photos. The very small, white orchid flowers begin to open first from the bottom of the stalk; the buds look like fuzzy little pearls before they open. Native Americans used this plant to treat snakebite and burns. Maybe that’s how it got its name! Others have suggested the pattern on the leaves looks like snakeskin and the dried flower head resembles the rattles on a rattlesnake’s tail. Either way, look for this exotic plant on your next walk through oak or pine forests. It is a true woodland beauty! In Australia, we have some orchids that have very similarly veined, blue-green leaves. However the flowers are very different. The flowers of this orchid remind me of our onion orchids, except ours are totally green, and very small!